We want the V&A to matter to more people and to inspire them wherever they live. We are committed to providing the best possible physical and intellectual access to all our collections and expertise throughout the UK, as well as at South Kensington and the V&A Museum of Childhood in Bethnal Green. Here are just some of the ways in which we enable as many people as possible to interact with our collections all over the country. V&A Dundee, due to open on 15 September 2018, will be Scotland’s first museum dedicated to design, telling the story of Scotland's design heritage and bringing the most important international exhibitions from the V&A to Scotland. It is being developed by Design Dundee Limited, a new organisation established through a partnership between the V&A, Dundee City Council, the University of Dundee, Abertay University and Scottish Enterprise. The Wedgwood collection is one of the most important industrial collections in the world and a unique record of over 250 years of British ceramic production. Now owned by the V&A following a successful fundraising campaign, spearheaded by The Art Fund, it is on display at the Wedgwood Museum, Barlaston, Stoke-on-Trent, on long-term loan from the Museum. The V&A and Museums Sheffield established a formal partnership for the development of the Millennium Gallery in Sheffield in 1999. The partnership continues through exhibitions, curatorial and learning projects, and staff development. With support from Art Fund, the Victoria and Albert Museum runs a programme to help the development of curatorial expertise in the art and culture of photography, working with regional museum partners. The programme has been in place since 2014, and has resulted in collaborations with Nottingham Castle Museum & Art Gallery and Museums Sheffield. The curatorial trainee post provides practical training in photographs curatorship and equips a Curator with specialist knowledge of photography and the ability to care for and develop photography collections. It provides an unparalleled practical training opportunity in photographs curatorship in the UK to build expertise in the field. Art Fund has agreed to support a third year of the Victoria and Albert Museum’s programme to help support the development of curatorial expertise in art photography, working with regional museum partners. Applications are welcome from organisations with a permanent collection of art photography who are able to identify a discrete project for the assistant curator to deliver which will benefit the collection, the organisation and its audiences. It is likely that the successful partner will not currently have staff expertise in art photography. The project will result in material outcomes for the regional partner which could include, but are not limited to, an exhibition, a refocus of the collecting policy, a publication or cataloguing of the collection. The V&A and the Royal Institute of British Architects (RIBA) partnership aims to promote the understanding and enjoyment of architecture. The Partnership brings together the RIBA's drawings and archives collections and the V&A's collections of architectural drawings and photographs at one location - the V&A in London. It also brings together the expertise of each institution in an exciting new programme of temporary exhibitions at the V&A, at the RIBA, and on tour. The Arts Council England/V&A Purchase Grant Fund helps regional museums in England and Wales acquire objects relating to the arts, history and literature. The Fund is provided through Arts Council England Lottery Funding and has been managed by the V&A since 1881. Each year the Fund considers about 150 applications and enables acquisitions of around £3 million to go ahead. The V&A is immensely proud of the Arts Council England/V&A Purchase Grant Fund, which is unique and unrivalled in its scope. It is vital part of the V&A’s national activity. The V&A supports an ambitious programme of loans as a key means of making our collections more widely available to the public. 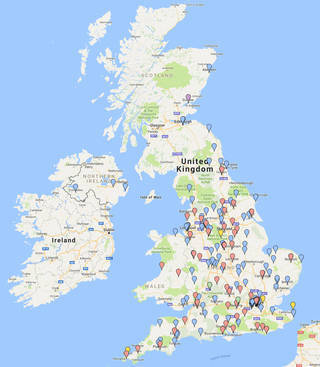 In any one year, some 2,500 V&A objects can be seen in many venues throughout the UK. The Museum of Childhood in Bethnal Green, London is home to one of the world's largest and oldest collections of toys and childhood artefacts. About 200,000 visits are made to our touring exhibitions each year. Touring exhibitions are perhaps the our most high profile off-site activity, enabling as many people as possible to engage with the V&A and its collections. We work with a range of educational, cultural and community organisations, both formally and informally, to bring long term benefits to the institutions concerned, to the public - internationally and in the UK - and to the wider economy. We have developed Design Lab Nation to support the teaching of the new Design and Technology GCSE to secondary school students. Working with Culture Coventry, Blackburn Museum, Museums Sheffield, The National Glass Centre, Sunderland and the Potteries Museum, Stoke on Trent bringing together secondary schools in partnership with local museums and regional creative industries to inspire students, train teachers and preserve the essential role that Art, Design and Technology plays in education for young people. We are working with two of the 10 consortia participating the Museums and Schools programme, funded by the Department for Education via Arts Council England. We support Culture Coventry and Pennine Lancashire Museums to increase engagement with local schools and encourage repeat visits by sharing expertise, co-devising sessions and supporting school trips to London and teacher CPD. Knowledge and skills are a vast resource built up by curators, educators, conservators, students and research fellows. Advice is disseminated to government, national and international audiences through publications, touring exhibitions, talks, seminars and web resources. These links are both academic and practical, formal and informal.